DOES THE IDEA OF ETHICAL LIVING FEEL IMPORTANT BUT OVERWHELMING? WOULD YOU LOVE TO BE A FAMILY THAT DOES LIFE MORE THOUGHTFULLY? DO YOU WANT YOUR KIDS TO CARE FOR THE EARTH AND THE PEOPLE IN IT? Attempting to live more ethically can be overwhelming. You may feel like you have no idea where to start or maybe even that what you are doing isn't making a difference. I get it. I really do. You might be frustrated that you're not informed enough and feel stuck because it feels like there is not enough time to research - or maybe the research available feels like a rabbit hole and you don't know where to start? Well, I hear you. And I'm here to pull you out of the overwhelm and ease some of that frustration. With over 70 pages packed full of valuable content, Down To Earth is not just a book, but a resource you can come back to time and time again for reassurance and motivation. INTRO - WHY BE ETHICAL? What impact do our everyday family choices have on people & planet? What are the benefits of more thoughtful living? Why our consumption is harmful for us, the world and others. How to curb your consumerism with top tips and supportive ideas for raising conscious kids in a consumer culture. The ethics of food and the benefits of seasonal eating. Taking control of food waste and simple tips for growing your own food. The effects of chemicals in household products, greenwashing and the worst culprits to look out for. Easy every-day eco cleaning hacks and green hygiene tips and recipes. Finding a cause for your family to connect with. Fun ways to encourage activism in your children. How to engage your kids in world issues without troubling them unnecessarily. USE THIS RESOURCE TO EMPOWER YOURSELF, YOUR FAMILY AND GO AWAY FEELING GOOD, NOT GUILTY! 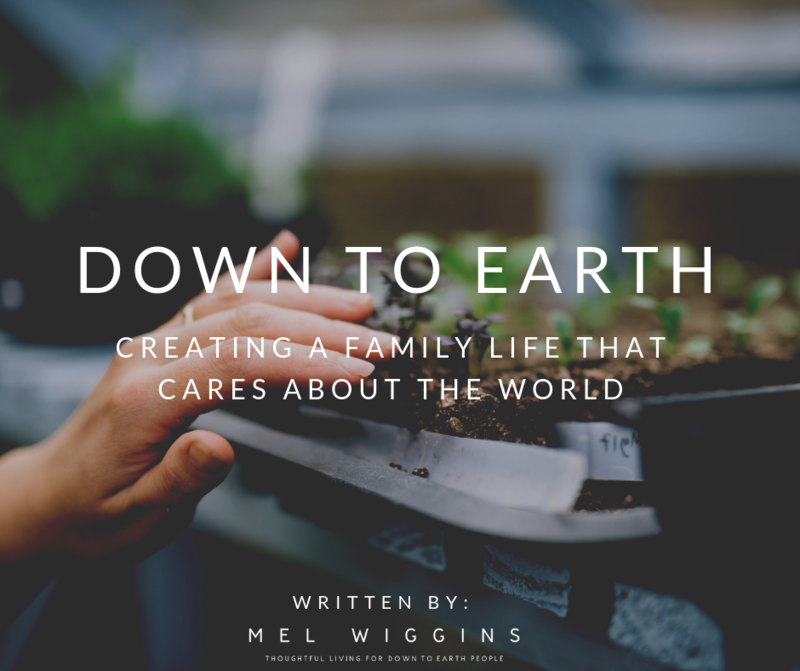 Nobody makes sustainable changes in their lifestyle by feeling guilty so ‘Down To Earth’ is designed to be a supportive guidebook to help you see the small changes you can make to create a family life that cares about the world. + make small significant changes in your home that will save you time, money and have a global impact? + really live a life that aligns with your values and feels good, not guilty? + find fulfilling and fun ways to engage your kids in a love for the earth and others? + develop a happier and healthier family life by living more intentionally? + feel more connected to the world, instead of a passive part of it? Mel broke things down into simple bite sized ways which was manageable for every day life which can be busy. She took a subject which can be quite overwhelming and made it easy to understand.